We know that many parents and teachers have long been in favour of quality apprenticeships – but just not for their own children. We know that under the previous apprenticeship programme, not all apprenticeships delivered the levels of skills training or opportunity that they aspired to. We also know that, despite the significant effort and cost that’s gone into creating and promoting apprenticeships, employers have continued to complain of severe skills shortages. The Institute for Apprenticeships aims to address this, and to drive up the quality of apprenticeships. We do this in full partnership with employers in a context that the Apprenticeship Levy has stimulated – engagement from employers themselves in the proposal and design of apprenticeship standards where they want to meet their own skills needs. every care is taken to ensure that those who pass these end-point assessments have demonstrated a credible and therefore transferable level of competence. The issue has never been to convince people that apprenticeships are a good thing, but rather that those on offer are credible, of the highest possible quality and promote employability. It’s true the number of apprenticeship starts have fallen over the past year. But this broad point masks a critical detail: since the introduction of the Levy and the new high quality standards-based apprenticeships, starts on legacy apprenticeship frameworks are indeed down; but the number of starts on the new employer-led standards is growing very strongly. In other words, employers are voting with their feet – and it’s a vindication of the reformed apprenticeships they created. Over the past year the Institute has come a long way in better supporting employers, and enabling them to do this work faster; we should soon begin to see the fruits of these efforts. 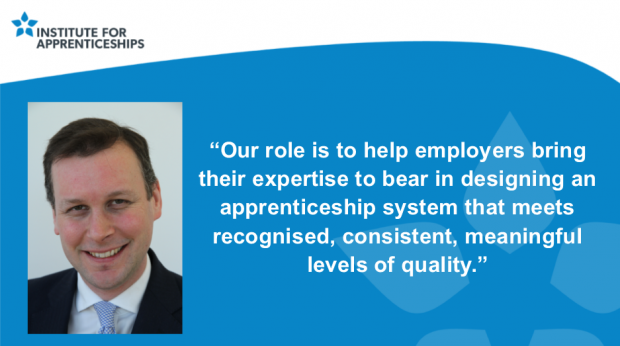 Meanwhile, we play an exciting and enabling role – in partnership with employers – in the development and approval of top quality apprenticeship standards, and we want more employers to get involved. We’re reaching out more effectively to ensure those involved in our work are truly representative of all kinds of employers, and that the standards we approve are deliverable in the highest quality. We are prepared to work cooperatively and enthusiastically with anyone who has ideas about how we can do this more effectively – so if you’re reading this and have ideas that could help us, don’t hesitate to make contact. And why do this? Because people like apprenticeships, they make a difference and they work - for individuals, employers and the nation as a whole. Who wouldn’t want to be involved in work like that?